Fast track entrance to Sagrada Família and Casa Batlló. Enter Gaudí’s world of fantasy and geometry and don’t leave Barcelona without truly understanding some of his most exceptional works. The tour will start at 9 AM on time. Please arrive 15 minutes before departure time. You will recognize us for our orange umbrellas at plaça Catalunya, in front of Hotel Olivia Plaza and Deutsche Bank. 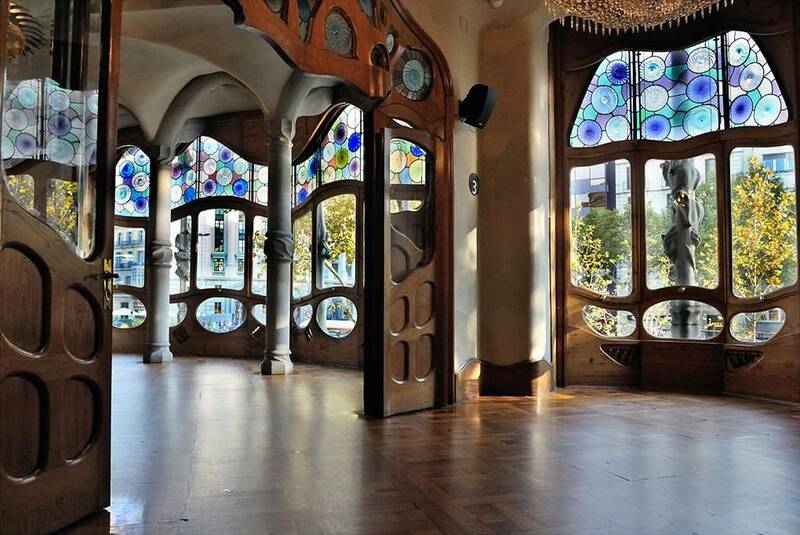 We start early so you can visit the Casa Batlló before everyone else arrives. Yes, we balance the tour with some free time in both Casa Batlló and Sagrada Família. And if you are hungry for more, you can always stay longer at the Sagrada Família, as that is where the tour will end. Free cancellation up to 24 hours or more before the starting time. There is no reimbursement if it is less than 24 hours. You can change the date free of charge up to 1 hour before the tour has started. "Don’t miss – great tour"
I usually dont do tours but this was great, easy reasonable in price and definitely worth it. We did a couple hour tour of the Sagrada familia and there are many things (details) we would have missed. Our guide was friendly and bus was immaculate clean .. in the afternoon we did the Monserrat tour and again tour guide was wonderful – she explained and gave much information and our bus driver was excellent as well. This was a great experience for myself and my mother. "Excellent Sagrada familia tour with Tanja"
behind. And Very comfortable coach and friendly bus driver. "One of our vacation highlights"
My wife and I had a fantastic time doing the Gaudí tour of Casa Batlló and La Sagrada Familia. Frankly, as awe-inspiring as the church was I could have spent a day admiring the former site as well. Our lovely tour guide, Amaia, was engaging and knowledgeable, sharing details of the history and construction of these magnificent buildings. Without question Gaudí was a true master of his craft. Although not on our tour I’d recommend a visit to Park Güell and Casa Vicens. The view of Barcelona from the park was stunning and of course there are so many colorful mosaics to appreciate along the way. "We had a fabulous tour led by Irina!" She was knowledgeable, amiable and fun. It was great to go straight to the head of the lines. I could not have been more pleased with our experience! Very knowledgeable about the local culture and traditions. A very kind and friendly guide! She made our day! We would see her again on our next visit to Barcelona! I would highly recommend this tour, as well Irina ! Visited on November 2018. Reviewed on Tripadvisor by Mc Cue. Circuito muito bem concebido. A nossa guia Amaia foi inexcedível de atenção com todos as pessoas do grupo, muito conhecedora das materias de que falava e muito simpática. Bom domínio do inglês e clareza nas explicações. Visited on November 2018. Reviewed on Get Your Guide by Antonio. This was a superb tour with a kind, knowledgeable and very organized guide, Sonia Crespo. From her fascinating commentary, we learned a tremendous amount about Gaudi and the issues he considered as he designed the Casa Batllo and La Sagrada Familia and were able to understand two other Gaudi constructions that we visited on our own. Sonia also answered our questions about other aspects of Catalan and Barcelona culture, so we came away with some understanding of the issues facing the people of Catalonia. The tour was also well-organized. 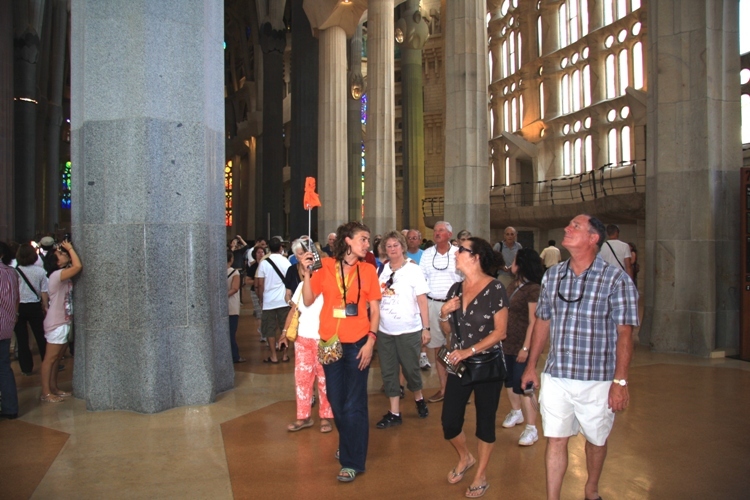 By ending with La Sagrada Familia, participants had the option of staying and exploring the building on their own. Finally, the listening devices were amazingly clear–even for someone with hearing loss like me. My husband and I were in Barcelona for a few days during the midst of a taxi strike. We opted to join a Gaudi tour and our guide, Anna-Lluisa, could not have been better. She was friendly, knowledgeable, and patient. The radio earpieces allowed everyone to get all the information she had to share without interfering folks not on our tour. The Casa Batllo gave us a taste of the genius of Gaudi and our guide gave context to what we were experiencing. Words cannot do justice to the Sagrada Familia but she gave us enough information to understand what we were seeing and then allowed us enough time to just soak it in. It was really an exceptional experience and I thoroughly recommend it. Bravo, Anna-Lluisa. "The tour was well organized and the audio devices made it easy to hear our well prepared guide. I have been in a lot of cathedrals in my travels but I never saw anything like Sagrada Familia. It is amazing". Visited March 2018. Reviewed on Veltra by David. An excellent tour. Well organized and we had a good ratio of participants to guide (there were two guides on the bus). Our guide, Irina, was excellent: very knowledgeable, had a nice sense of humour, and was very well organized. The tour allowed us an overview of Gaudí’s life and work and in-depth visits to the Casa Batlló and the Sagrada Familia basilica — which are overwhelmingly busy places but we were well “shepherded” by Irina. Loved our tour of Gaudi. The Sagrada Familia is likely the most impressive structure I have ever seen. And the house the Gaudi remodeled was pretty amazing too. Our guide, Sonia, was so, so good. She knew all the important stuff to know about the two places we stopped and was so enthusiastic about explaining it to all of us. Really worth every penny for this tour. I participated in the Gaudi tour with my mother, who had a mild disability in her legs. The tour covered the highlight of Gaudi monuments, which was a good introduction for our stay in Barcelona. Our guide, Ms Nuria Bargallo, was not only an excellent professional guide, but also paying a great attention to participants' safety and comfort. For example, as my mother walked with a stick, she proposed us to take elevators in each monument when available. We really appreciated her assistance. Her explanation covered from the history of monument itself to Catalonian culture and language, which was really interesting. 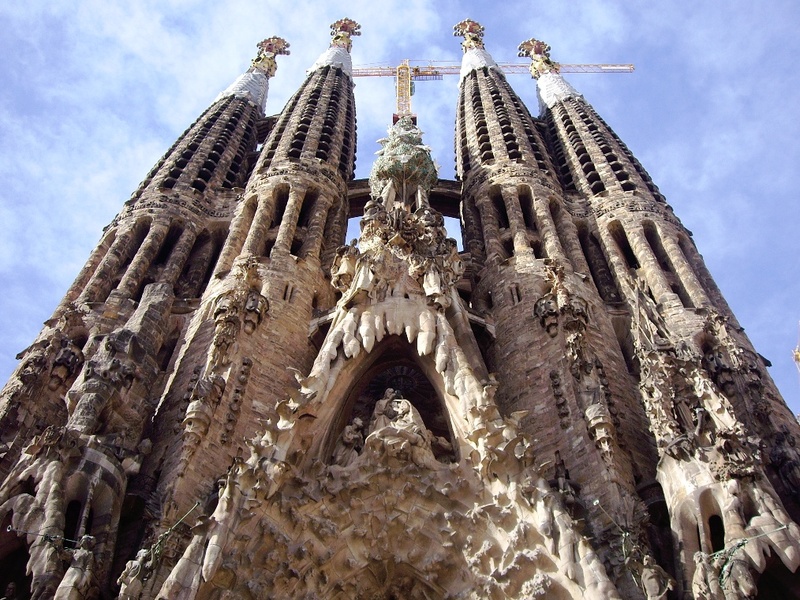 Thanks to this tour, we could discover amazing Gaudi monuments. Visited July 2017. Reviewed on tripadvisor by Turmaline from Nagoya, Japan. We had an excellent morning trip with BGB, Ellie showing us the Casa Ballo and Sagrada Familia. We were transported via a comfortable air conditioned coach, were given lots of interesting information along the way by Ellie. As the trip was early, the Casa Ballo was lovely to visit with little crowds (we git there for group entry around 9am). The Sagreda Family was very busy, but Ellie showed us around, was polite enough to block the entrance and exits (unlike some other tour groups) and made it easier for us to visit this beautiful church. We highly recommend this touring company and specific trip. Well worth looking into. A fabulous way to spend a morning in beautiful Barcelona. A knowledgable guide, Tanja escorted us with humor, patience and passion, imparting her vast knowledge on the subject Gaudi and Barcelona. From Placa de Catalunya in a lovely air-conditioned bus, driven by Jesus, to Casa Battlo, an incredible architectural wonder, through the streets to Sagrada Familia, a mind-blowing and awe inspiring experience. Highly recommend this tour. We were extremely pleased with the Gaudi tour and our guide Laura. She was extremely knowledgeable, pleasant and enthusiastic. You could tell she loves her job. Her eyes would light up as she explained in great detail the history of both locations. You definitely need a guide or you'll miss the meaning of the attractions. It was great bypassing the long lines. I highly recommend the 3 1/2 hour Gaudi tour on Barcelona Guide Bureau. Very interesting and complete tour of the Gaudi Batllo and Sagtada Familia narrated by our guide Laura. We found the information very accurate and it was presented in a manner that was entertaining and well understood. The use of the transmitter was very effective and inclusionary. Great job and would highly recommend this tour and the guide. Bravo!!!! Our tour guide Oliver was fantastic from start to finish. Everything was organised brilliantly which meant we had superb tours. Oliver was so informative but also with good humour so it was easy to listen, look and understand! I have used this service in a few cities now and will continue to do so as I have had such great experiences. Thank you so much, especially Oliver and Nuria! 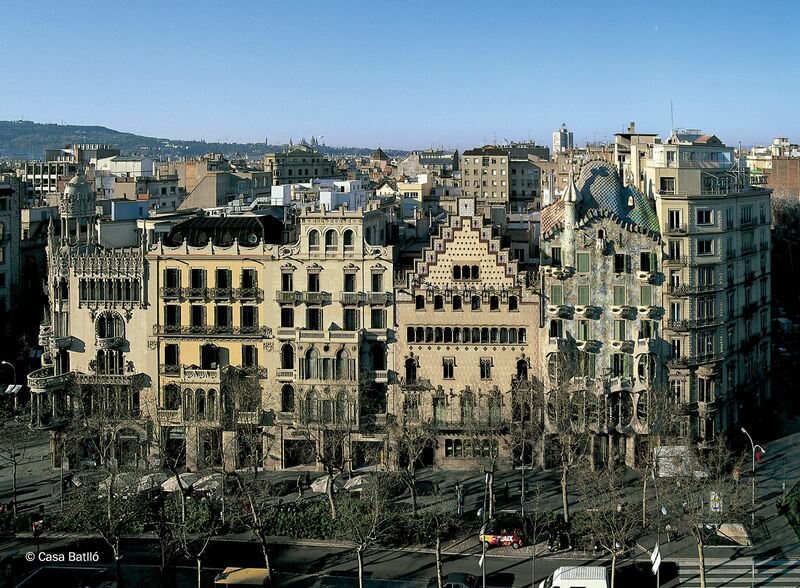 This tour gives a very good overview of Gaudi's influence on Barcelona. We especially liked seeing the Sagrada Familia both inside and outside and hearing the history of how it evolved and still is evolving. Our tour guide was very knowledgeable and gave us interesting tidbits about Gaudi's life. We highly recommend this tour for anyone planning to visit Barcelona. We just returned from a trip to Spain. Our first day in Barcelona included this Gaudi tour with tour guide Mariona. The bus was beautiful and we could see very well. The tour was in very understandable English with individual headsets. I have some hearing loss, and can often not hear the guide very well, but on this tour I could hear everything perfectly. 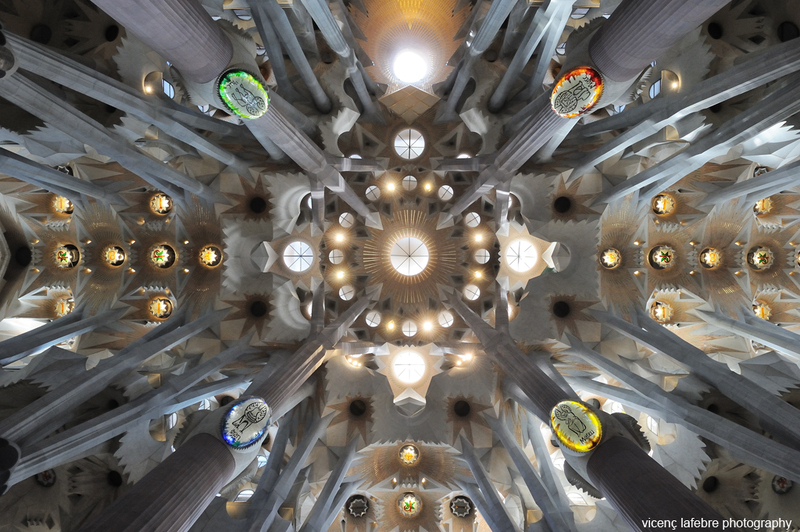 The tour involved walking within the Sagrada Família and Casa Batlló, but it was not exhausting like some tours. Be sure to close the door to the laundry room (behind us in the photo) on the roof of Casa Batlló to see a light show inside!! Mariona was extremely knowledgeable and told some interesting and funny stories. The tour was fantastic, and I would highly recommend it, Mariona, and the Barcelona Guide Bureau! We do not particularly like organised tours but sometimes it is worth it to ensure you get into places such as Sagarda Familia. Sonia was a great tour guide. We saw Batllo, the Gaudi remodelled house. Sadly not enough time to linger for a further 15 minutes or so. The Sagarda Familia was stunning me Sonia took so much time to explain some of the finer details. Loved it. Would have liked another 30 minutes with the option of a tower tour but that is the downside of organised tours. Did the Gaudi Tour with the Barcelona Guide Bureau. Tanya was a really fun, efficient and informative guide, very comfortable coach and not having to line up for tickets to Casa Battlo and the Sagrada Familia a real bonus. Would definitely recommend using this company when visiting Barcelona. Wow what a great experience, this skip the line tour was amazing and well worth the price. The guide was extremely knowledgeable, spoke fluent english. We visited one of the homes done by Gaudi which was soooo beauriful, and the guide told us a great deal of detail on how the house was removated by Gaudi noting specifics about the how it was engineered, he showed us small details such as venting to cool the room. He knew so much about Sagrada Familia Church and all the details such as how Gaudi figured out how things should be structured, he discussed marble and why pilars were made of different stone and why and what is being done now and in the future. He was such a great guide and this tour was worth every penny I would recommend it and give it a 10 out of 10. I am a senior with a mild to medium walking problem and had no problem walking on this tour, they had an elevator in the house so you could use that to access the upper floors, kudos for a great tour. Took the 9:00 am tour including Casa Batllo which is a don't miss. Then on to the Sagrada Familia basilica. Our guide, Tanja, was amazingly knowledgable which made the tour really worth it. She was obviously very experienced and knew all the right places from which to view the buildings. Not only that she was charming and her English was barely accented and she spoke very clearly. Highly recommend BGB and especially Tanja. 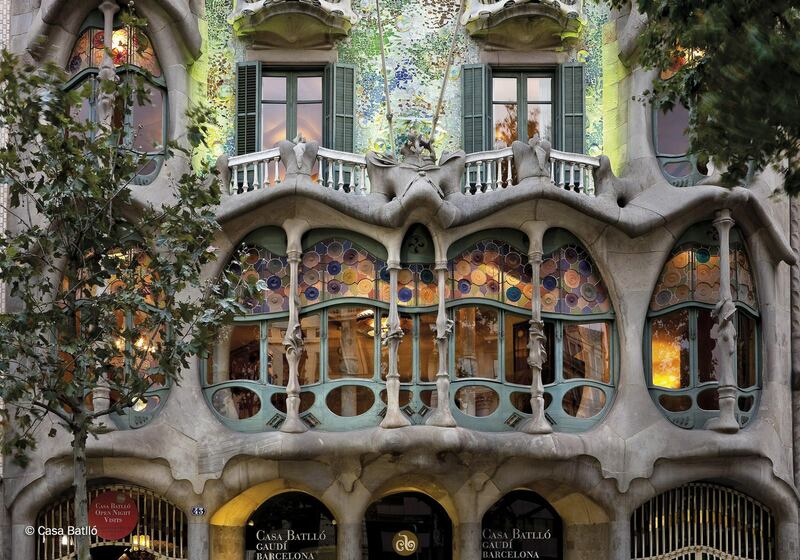 "First-class tour of Gaudi architecture" 5/5 stars. To pass the long line to enter the magnificent Basilica Sagrada Familia is the worth the cost of the tour but then to be escorted and educated by a well informed tour guide was well beyond our expectation. We also visited the Casa Batllo with the same guide walking us through this Gaudi masterpiece. You can visit both sited on your own but you won't have the luxury of a guide. Part bus tour. Part walking tour. Fantastic guide. Enjoyed the tour of Casa Batllo. La Sagrada Familia was inspiring. Both parts of the tour were better than I expected. Learned much. Glad we had reservations and did not need to stand in line to enter. The headphones were wonderful. Enabled us to hear our guide even when we were not close to her. I highly recommend the tour. We particularly wanted to see the Sagrada Familia and Casa Battlo, this covered both. Cost was reasonable and also included entrance fees to both sites. Our guide Arturo/Arthur was very professional and knowledgeable. At both places we were given adequate free time to look around. Also our bus driver Zac was very good. Length of tour was three and a half hours, which was plenty. We toured in the morning starting at 9.00 am before the heat of the day. Our guide was Laura, and she was wonderful. The headsets and receptors made it easy to hear everything at the Casa Batlló and the crowded Sagrada Familia. She was enthusiastic and made the tour very enjoyable. The bus was comfortable and cool on a very hot day. The speakers in the bus were very clear and easy to understand, so often not the case. It was a great morning and we learned a lot. Highly recommended. Our guide was friendly and thorough in his explanations of the history behind Casa Batllo and Sagrada Familia, the two main sites we visited. Our guide had many anecdotes about Gaudi and drew our attention to interesting details of each place. We received small headsets which made it easy to hear him and follow the tour. He also placed Gaudi in context of his time and showed us examples of buildings done by his rivals. We had the option to remain at Sagrada Familia (though we would have had to arrange our own transportation back to our hotel) and explore on our own, which, in retrospect, I wish that we had done. We used another tour bureau in Barcelona for a tour of Parc Guell, Casa Milia and Sagrada Familia and their tour did not include admission to Sagrada Familia. We found that it fell far short of BGB. If I ever have the opportunity to return to Barcelona I will use Barcelona Guide Bureau exclusively.